On a gorgeous Friday evening at Lusitano Stadium, the Pioneers were once again able to hold on for the tie, this time against GPS Portland Phoenix. After a goal scored by Emilio Ycaza in the 46’, the Pioneers found themselves down once again until Alencar Ventura Junior and Alex Wrona linked up to tie the game up in the 69’. The Pioneers and Rafael Pereira were showing that they can make plays when they need to. Pereira displayed another world class performance in net which allowed the Pioneers to tie the game. Richard of Springfield won the Big Y raffle! Thank you Big Y! 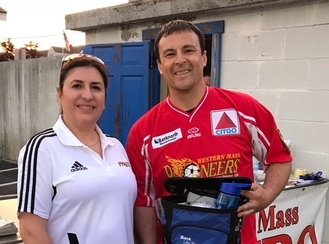 Paula presents to Paul the LUSO Federal Credit Union prize! 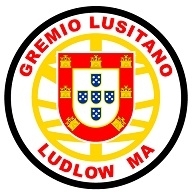 Thank you LUSO! Eli from Palmer wins the psi91 Kick Challenge! Vashon from Springfield wins the psi91 Kick Challenge!